Transmetropolitan is a cyberpunk comic book series written by Warren Ellis with art by Darick Robertson and published by DC Comics. The series was originally part of the short-lived DC Comics imprint Helix, but upon the end of the book’s first year the series was moved to the Vertigo imprint as DC Comics cancelled the Helix imprint. It chronicles the battles of Spider Jerusalem, infamous renegade gonzo journalist of the future, an homage to gonzo journalism founder Hunter S. Thompson. 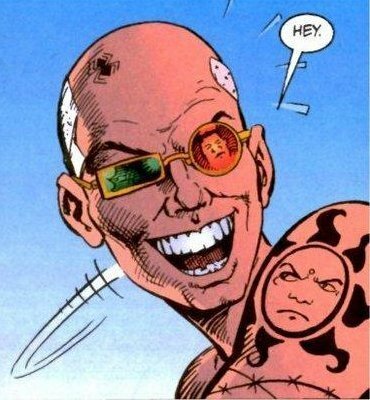 Spider Jerusalem dedicates himself to fighting the corruption and abuse of power of two successive United States presidents; he and his “filthy assistants” strive to keep their world from turning more dystopian than it already is while dealing with the struggles of fame and power, brought about due to the popularity of Spider via his articles. I’ll admit, I’m not really familiar with Hunter S. Thompson other than the basics I’ve gleaned over the years. But I’m about 3/4 of the way through Year 1 and I’m really grooving into it. Art: The art is pretty awesome. It does a good job of showing how vulgar this future is while being oddly beautiful at the same time. Themes: What does it mean to be human? Is it the brain? The body? The soul? What happens when you change any of those things or graft on technology or download yourself to a very literal “cloud?” It touches on police brutality, political corruption and of course, journalism. I would certainly call it transhuman. I don’t have a LOT of comic experience, but I definitely recommend this one based on what I’ve read so far. All kinds of alternate sexualities are present, and only occasionally used to turn down Spider, but it isn’t the focus of the story. Happy Towel Day everyone! Pick up a Douglas Adams book today and discover the answer to Life, the Universe and Everything. Spoiler alert: The answer is 42.